Absorption is the process which takes place, when one substance enters the volume or bulk of another substance, while adsorption is the condition which occurs on the surface of the substrate. In the case of adsorption, there are the intermolecular forces, which make the molecules to hold each other, but in absorption, there is soaking of the liquid or gas by the solid rather any forces applied on molecules. Here we noticed that there is the common term used in both the words is the ‘sorption‘, which describes the action performed by the absorption and adsorption. Though both are the vital process occurring in the day to day life, as well in chemical and biological labs. Very slight though the significant difference between both the process will be considered in this content, along with a brief description. Meaning The condition in which any substance (atoms, ions or molecules) is taken by or absorbed by another substance, especially in the solid or liquid material. In this condition the substances like gas, liquids or dissolved solids loosely adhere or stick to the surface of another substance which can be solid or liquid. Reaction Rate The reaction occurs at the uniform rate. The reaction rate increases slowly and attains equilibrium. Heat exchange process Endothermic process. Exothermic process. Concentration Does not change is constant throughout the medium. The concentration changes from bulk to the bottom of the absorbent. Temperature No effect of temperature. Adsorption works at the lower temperature. Application Cold storage, ice production, turbine inlet cooling, refrigerants. Air conditioning, water purification, synthetic resin, chillers. As discussed above absorption is the bulk process which means that the substance or absorbate like any ion, molecule or compound diffuse completely into another medium or substance which can be solid, liquid or gas. Here the absorbing material (absorbate) remain intact in another substance (absorbent) due to the presence of space within the substance but do not have any chemical relation with each other. Once the substance or absorbent get absorbed into another substance, it cannot be separated easily. Commercially they are used in the cooling system, cold storage, refrigerants. Adsorption is the surface phenomenon, in this condition, there is the accumulation of the substance (adsorbate) like solid, liquid or gas on the surface of another substance (adsorbent) which can be solid or liquid. In this, the substance or absorbate are loosely held with the absorbent and classified as physisorption and chemisorption. In physisorption, the molecules or the interactions between the substances is of weak van der Waals forces, while in chemisorption it is through the covalent bond. It is applicable in action of drugs and poisons, in the formation of enzyme-substrate complex, in the biochemical technique, water purification, air-conditioning. Absorption can be defined as the condition in which any substance (atoms, ions or molecules) is taken by or absorbed in bulk by another substance which can be solid or liquid material, controversially adsorption is the surface phenomenon where the substances like substances like gas, liquids or dissolved solids loosely adhere or stick to the surface of another substance which can be solid or liquid. In absorption the reaction rate is uniform and is an endothermic process, while in case of adsorption the reaction rate is steady and attains equilibrium, it is an exothermic process. 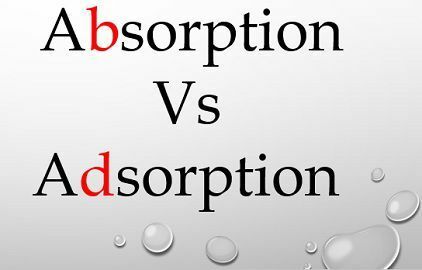 The concentration of the absorbed substance does not change in fact remains constant throughout the medium, but in adsorption, the concentration of the adsorbed substance changes from bulk to the bottom of the absorbent. Absorption does not affect temperature, but adsorption works at the lower temperature. Cold storage, ice production, turbine inlet cooling, refrigerants are the area where absorption is applied, while air conditioning, water purification, synthetic resin, chillers are the area of applications of adsorption. Absorption and adsorption are the kinds of homophones, but their meaning and application differ and so cannot be substituted in each other context.